Microsoft Sphere: Anyone for 3D Pong? Microsoft Sphere - anyone for 3D Pong? Microsoft's much-touted touchscreen Surface PC has gone all 3D and spherical, with a new video from Microsoft's research labs in Redmond showing off an impressive new prototype of the Microsoft Sphere. 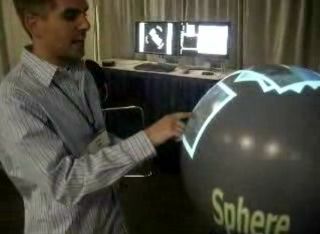 The spherical computer prototype's multi-touch user interface uses infrared tech to detect hands and fingers dragging icons across the screen, in addition to an internal projection system developed by Global Imagination. "It's really an exploration of ideas," noted Hrvoje Benko, the Microsoft researcher heading up the Sphere project. "What we are seeing is the emergence of various kinds of interactive surfaces…This is one surface that might be serving a particular purpose, but it should probably live in an ecosystem of other surfaces. So what's really interesting to us is what kinds of interactive surfaces we can make, how well we can make them, and how people interact with them -- how they are used." You can see in the demo video that Microsoft is using the Sphere prototype to demo 360-degree video, photo manipulation, globe-spinning and – perhaps most awesome of all – a 3D version of Pong!